The focaccia itself is super light and airy with a thin and crispy crust. You could top it with your favorite toppings.. or you could just brush the dough with olive oil and sprinkle it with a little sea salt and crushed red pepper. I was thrilled with how this BLT focaccia turned out. The bread is filled with little surprises throughout... a pocket of cheese here, a bit of bacon there, a burst of tomato here and there. You top the whole thing with even more bacon and just enough lettuce to call it a BLT. First, you will need to make a "sponge," which is a mixture of flour, water, and a tiny bit of yeast that you let ferment overnight. The dough itself has a tiny bit of rye flour, which is great for helping develop a hint of sourdough flavor. Second, you will need a 10 inch round cake pan, or a pan that is somewhat equivalent in area, like a 9 inch square cake pan (practicing my geometry). The dough for this focaccia is super wet, which helps create an airy and light bread. Don't be tempted to add more flour. It's easiest to mix the dough with a stand mixer because it's so sticky, but you can mix it by hand. The dough also requires one set of "stretch and fold" during the first rise. 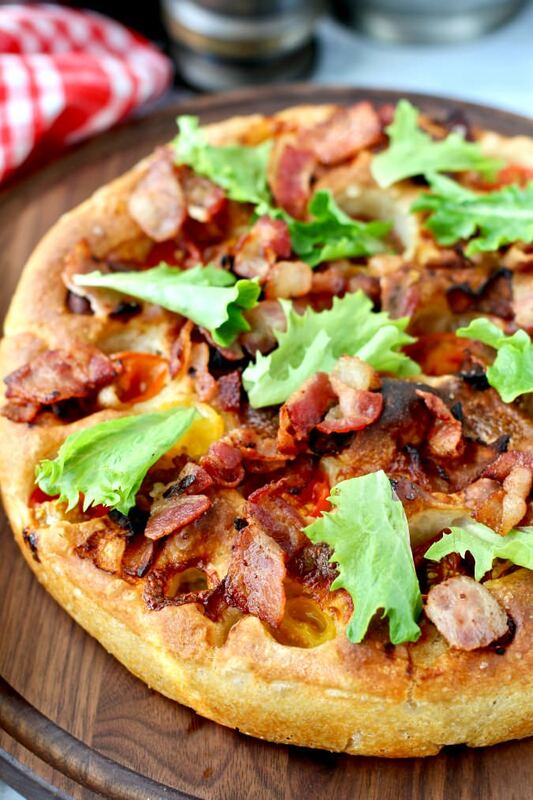 Finally, don't be afraid to push the toppings into the dough, especially the bacon. I liked having just a bit of the bacon, tomatoes, and cheese peeking through the top of the focaccia. You might get some burned edges on the bacon, but that's okay. 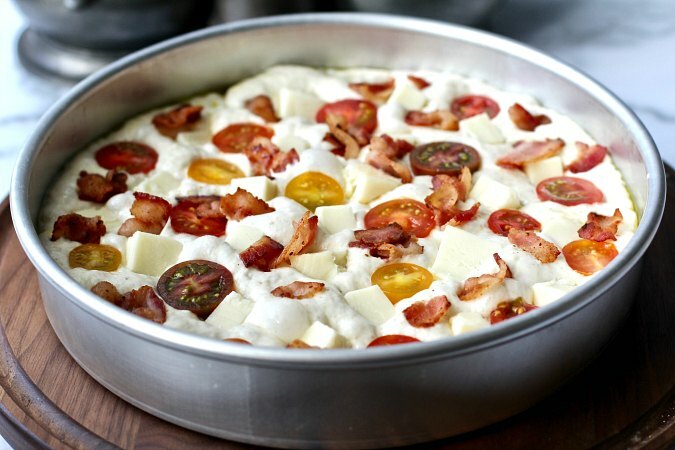 You will reserve most of the cooked bacon for topping the focaccia after it has fully baked. You can always par cook the portion of bacon that will be baked in the bread if you are concerned. I was perfectly happy with the bits of charred bacon in the bread. I used an assortment of heirloom cherry tomatoes because I liked the variety of colors, but any cherry or grape tomatoes would work in this recipe. For the lettuce, I used baby greens. I was tempted to toss the leaves in Miracle Whip salad dressing to pay homage to the BLT sandwiches my mom used to make, but I thought it wouldn't be that pretty. You could make a dipping sauce of your favorite creamy salad dressing for the slices. You can reheat any leftover focaccia (without the lettuce) loosely wrapped in foil in the oven for about 10 minutes at 350 degrees F. and then top the slices with fresh lettuce. 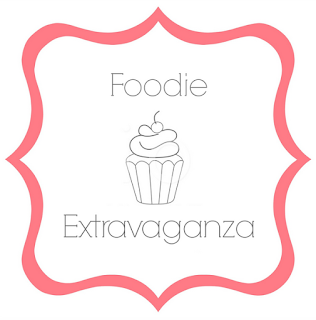 Our Foodie Extravaganza host this month is Sue of Palatable Pastime. In a small glass bowl, mix the sponge ingredients and stir with a spoon until combined. Cover the bowl with plastic wrap and let it sit at room temperature for 12 to 24 hours. The sponge should be very bubbly. Begin about 3 to 3 1/2 hours prior to baking time. 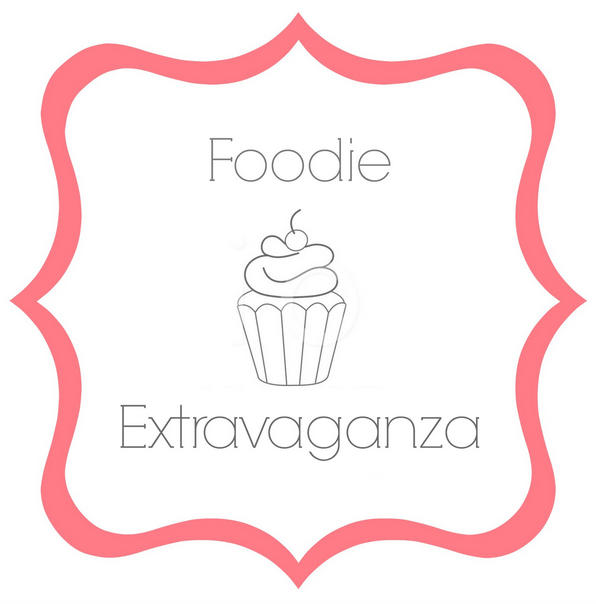 Add the water, oil, the sponge, the yeast, rye flour, and 212 grams of flour in the bowl of a stand mixer. Mix with a spoon or dough whisk, then mix with the dough hook of your mixer on low for about 2 minutes. Continue to run the mixer, and add the salt slowly. Increase the mixer speed to medium, and mix the dough until it is smooth and is beginning to pull away from the bowl. This should take about 6 to 8 minutes. Add additional flour in teaspoons if it is not pulling away from the bowl. Note: this dough is sticky, and will not pull away from the bowl like bread dough, so be very careful about adding too much flour. I added only 1 heaping tsp. Lightly oil a large bowl or dough rising bucket with olive oil, and add the dough. Cover with plastic wrap and allow to rise at room temperature until doubled, about 60 to 90 minutes. Stretch and fold the dough in the bowl or bucket. Pulling from underneath the dough, fold the four "sides" of the dough to the top center. Turn the dough over so the folded side is down and re-cover with plastic wrap, and let it sit at room temperature until doubled, about an hour. Place 3 tablespoons of the olive oil into the cake pan and tilt the pan to spread the oil evenly. Carefully scrape the dough into the prepared pan. Gently urge the dough into a round shape with your fingers, and cover the pan with plastic wrap. Let the dough rest for 30 minutes. Once the dough has rested in the pan for 30 minutes, gently press your fingertips into the round a few times to push the edges out. 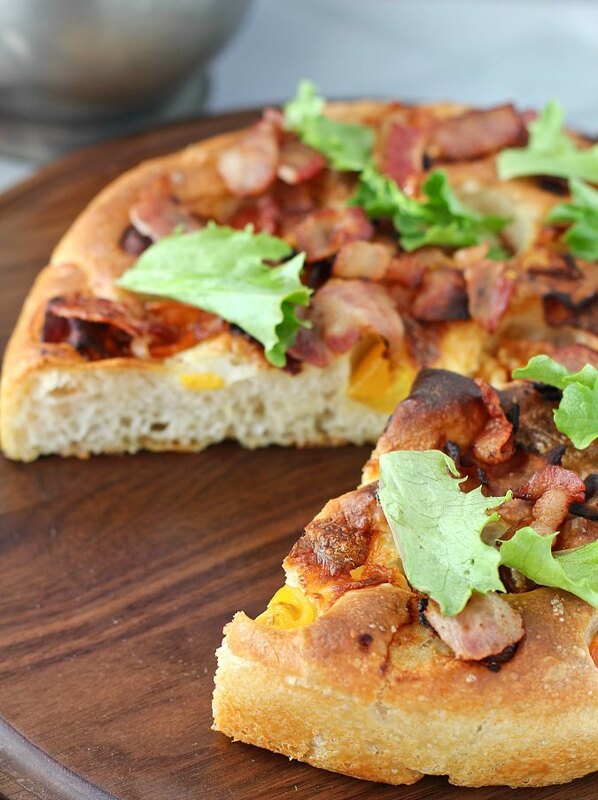 Press about 1/4 of the bacon pieces into the dough with your fingertips, one piece at a time. Press the pieces of cheese into the dough one at a time while pressing toward the rim of the pan. The cheese should be flush with the dough. Press the tomatoes into the dough using the same method. Let the dough rise, covered with plastic wrap, for about 30 minutes, until puffy. Bake until golden brown, about 30 to 40 minutes. Remove the pan and move the focaccia to a cooling rack by slipping a fork underneath and sliding it carefully out of the pan. Sprinkle the focaccia with the rest of the bacon and leaves of lettuce. You always amaze me Karen. Love this recipe. My focaccia always turns out to thin and crispy. I love charred bacon. It's in a horse race with charred bits of pepperoni. I think it really accentuates the flavor so I am always fine with it! It's right up there with burnt cheese and onions! 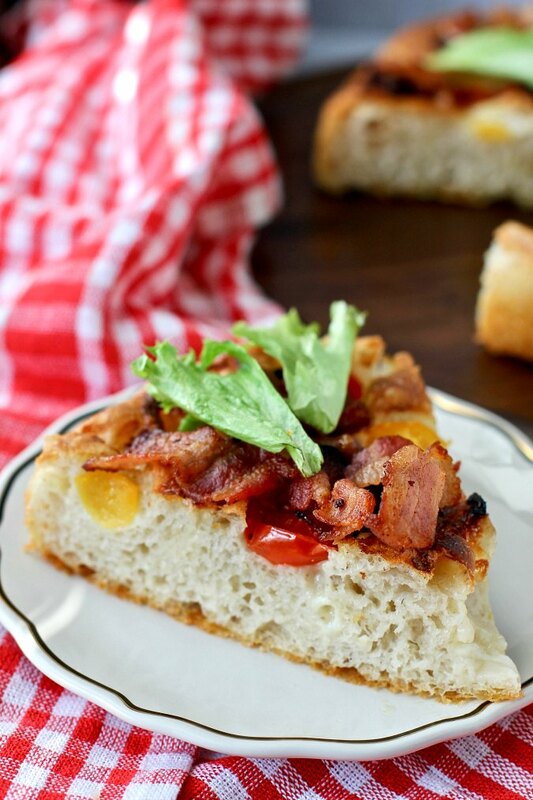 Delicious BLT focaccia, looking gorgeous. I love bacon, specially during breakfast. 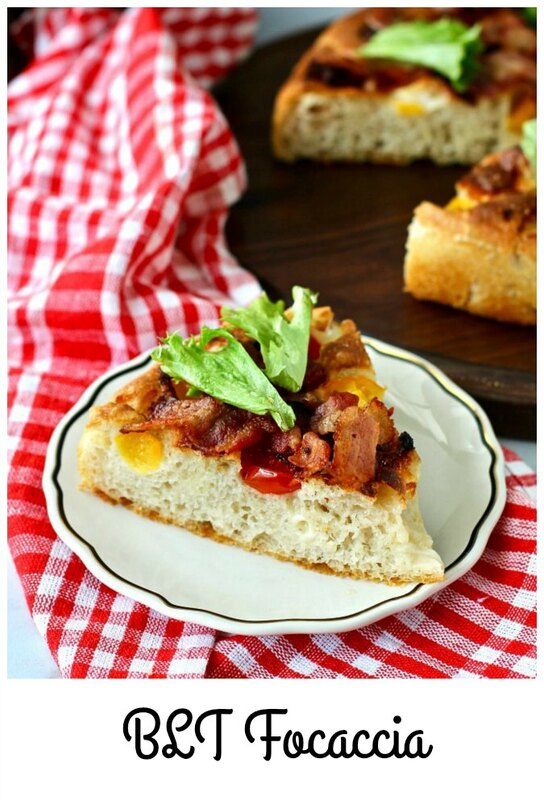 Never thought that it could be a BLT Focaccia. This looks amazingly delicious. Gonna ask mom to make one of these.